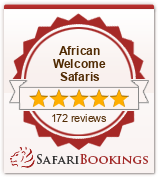 On the rocky hills of the Northern Serengeti, 20 lavishly furnished tents beckon. Let Serengeti Migration Camp show you how to live with the animals during the day and in colonial luxury at night. You’ve seen aerial shots of African herd migrations on television. Why not watch the world-famous wildebeest, gazelles, and impalas thunder past at ground level, live and in the flesh? Serengeti Migration Camp lets you do so without losing the comforts of home living. At the amply staffed campsite you’ll be set up in elevated, spacious tents complete with king-size beds, leather armchairs, and writing desks so you can jot down your adventures in your journal. Hot water and en-suite bathrooms are also included. Public amenities include a swimming pool and deck, and a sunset-viewing deck offering breathtaking views of the Ndasiata Hills and the Grumeti River. Serengeti Migration Camp’s friendly staff will be happy to set up personal picnics for you (including champagne) so you can indulge in delicious local cuisine while out in the bush. And of course, day-long game drives in open 4x4s are readily available, driven by knowledgeable guides. For nature-lovers, Serengeti Migration Camp’s location is unsurpassed – on the path of the Serengeti wildebeest migration, the largest mammal migration in the world. Like most good wildlife-viewing outposts, it takes a little work to get here. Nearly 150 miles northwest of Arusha, Tanzania, it is actually 8.5 hours by car on rough roads. However, you can easily arrange a flight to the Lobos airstrip and take a 40-minute charter flight directly to the site.